What's that in the sky, high above the castle ramparts? Is it a bird? Is it a plane? 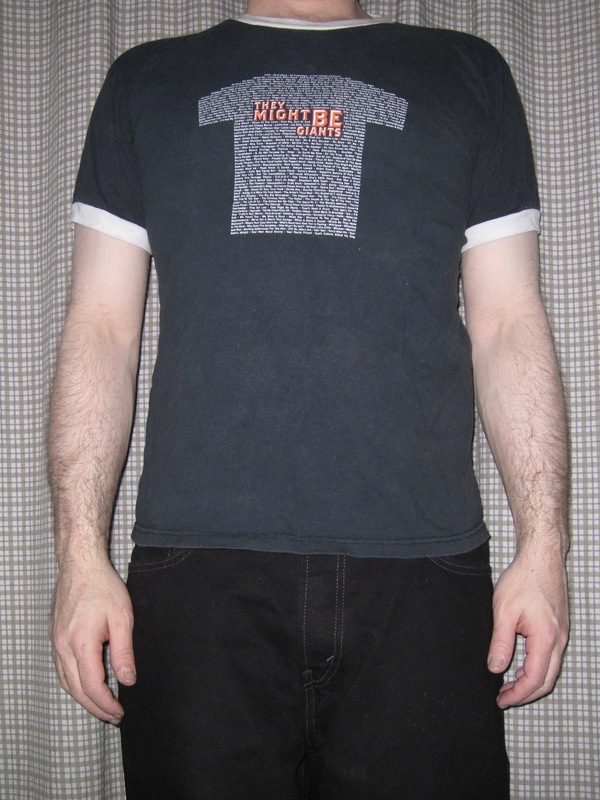 Also known as The Flying Carpet Shirt, the design comes to us from NY resident Michael Kupperman, whose work also graces the cover of TMBG's 1999 Internet album Long Tall Weekend. On the front of the shirt, Britain's Queen Victoria embarks on a bloody good magic carpet ride with a pair of proper-looking English urchins. 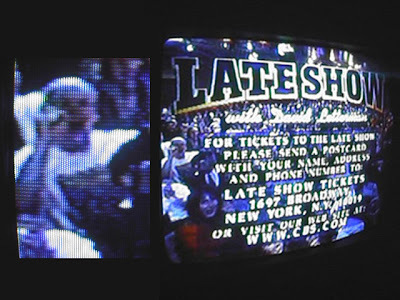 Back in 2000, I managed to get this shirt on television. Here I am in the audience for a taping of Late Show with David Letterman wearing my Queen Victoria shirt. I attempted to hold up a finger while pointing at the shirt with my other hand (TMBG#1!) , but it didn't quite resolve. 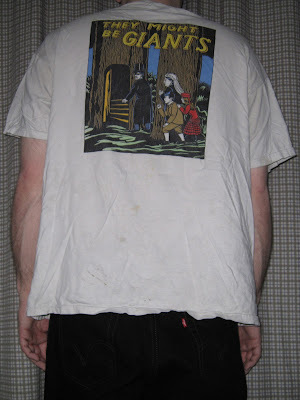 On the back, the matriarch and her companions are spying on a very shady looking masked miscreant, some numpty who is availing himself of a mysterious secret stairwell hidden inside the trunk of a tree, possibly to see a man about a dog. Blimey, who knows what adventures these scrutinizing sleuths will stumble upon?! During a show on 3/13/99 at Lupo's in Providence, RI, there's a disagreement over which John loves you; the sincere guy in the band, or the angry one with all the swear words. 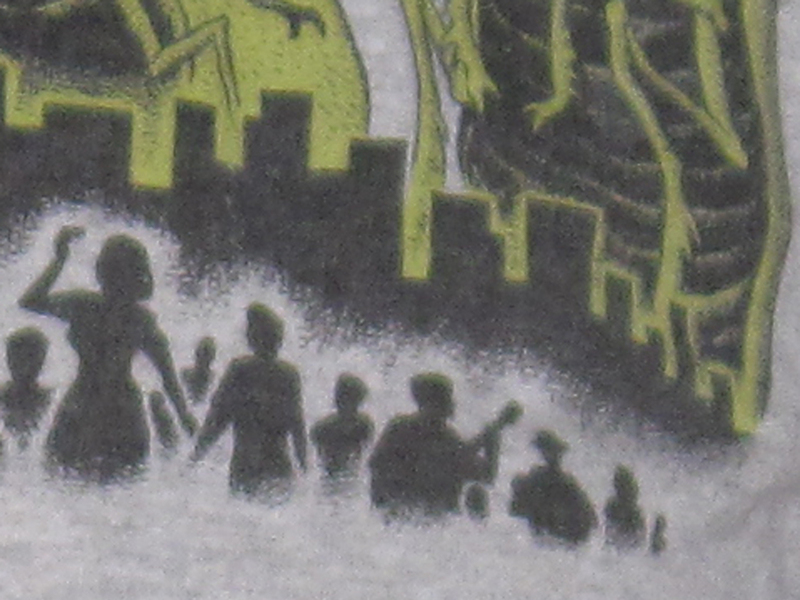 They Might Be Giant Insects on this week's shirt. Towering over the cityscape are a trio of titanic arthropods, with the band name splashed across the top in blood red. That's right, kids. 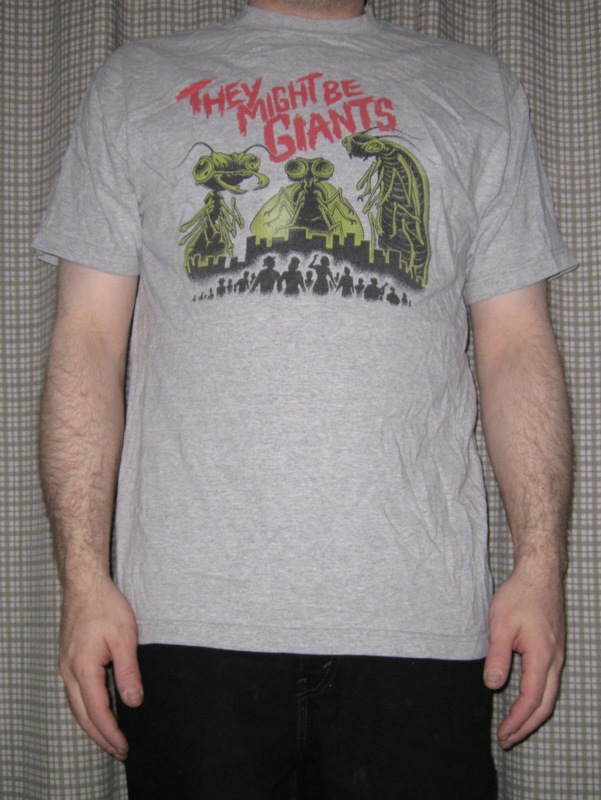 It's a monster movie of a t-shirt! Diabolically depicted by monstrosity authority Steve Blickenstaff, he describes his TMBG shirt experience thusly: "I met John Flansburgh at the 9:30 Club in Washington, DC back in the mid 90s when my friend Joe McGinty was playing keyboards in Mono Puff (Flansburgh's side project/band). John was familiar with the "Bad Music For Bad People" album cover artwork that I had done for the band The Cramps, and he asked me if I would be interested in designing a T-Shirt for TMBG. I remember we talked over some ideas via phone and fax. I sent him a page of rough design sketches and we decided that I would work up the giant insect theme. As a bonus I was also asked to design the back of the T-shirt as well which continued with the giant insect theme and featured several giant ants, one chewing on a telephone. I've always been a fan of old science fiction and horror movies so designing the T-shirt was a real treat for me. 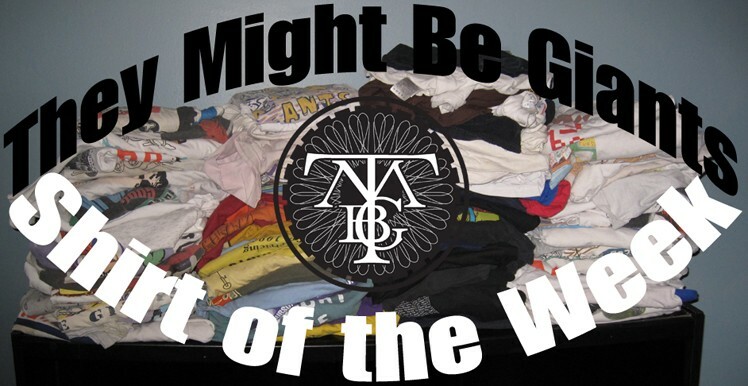 Not to mention that I'm also a huge fan of TMBG!" A crowd of people have gathered in awe of these menacing monstrosities, and wouldn't you know it, John & John have made it out! Among the silhouettes, on the far right are our guys sporting their guitar and accordion. Perhaps They came out to serenade our benevolent insect overlords. Or.. maybe the bugs are here for a TMBG show! Steve told me that he included them at Flansburgh's request, adding that in all these years, I am the first to point it out to him. Fortuitously, I only just discovered this amazing T-Shirt Easter Egg while preparing this blog entry. As Steve mentions, the giant bug theme continues on the back with some colossal ants, crawling around the telephone wires in the background and chomping on an old-fashioned rotary telephone in the foreground. Appropriately, we also have the Dial-A-Song number. 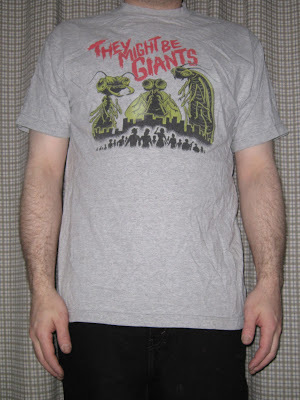 I also have the original, off-white version of this shirt, though "Bugs on Grey", pictured above is the one still available in the TMBG Merch Store. Just recently, this new version was introduced. 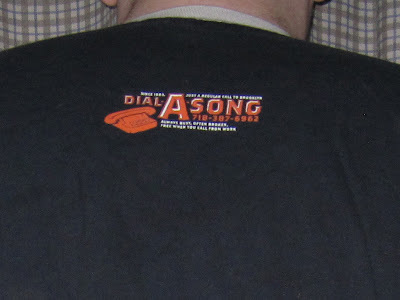 For those of us who are all about the telephone-chomping ants, it features a more sensible font with the design from the back on the front minus the DAS ad, and nothing on the back. 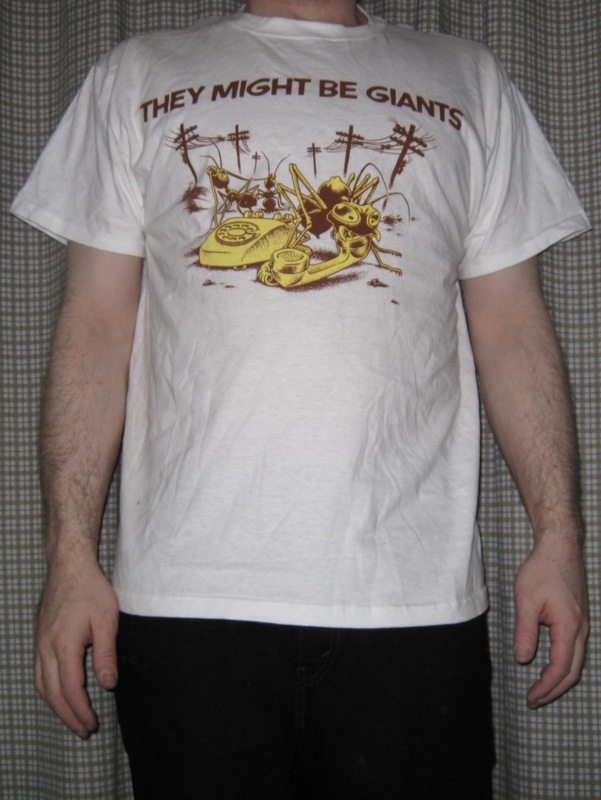 You can also purchase "Bugs on White" at the TMBG Merch Store. Here's the original version of the "Countdown" introduction recording that was used by the Johns just before They took the stage. Recorded on 6/20/88 at Tipitina's in New Orleans, LA. 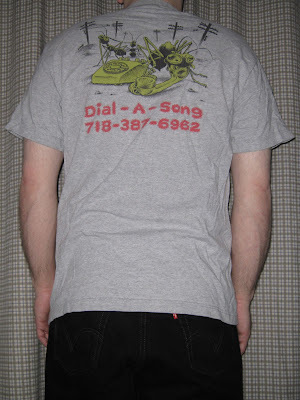 In 2003, TMBG celebrated 20 years of Dial-a-Song with this metarrific garment. 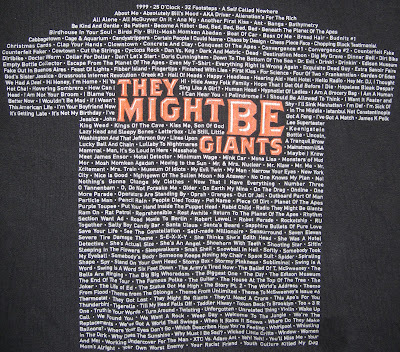 The name of the band is surrounded by an exhaustive listing of every TMBG song ever recorded up to the printing of the shirt. 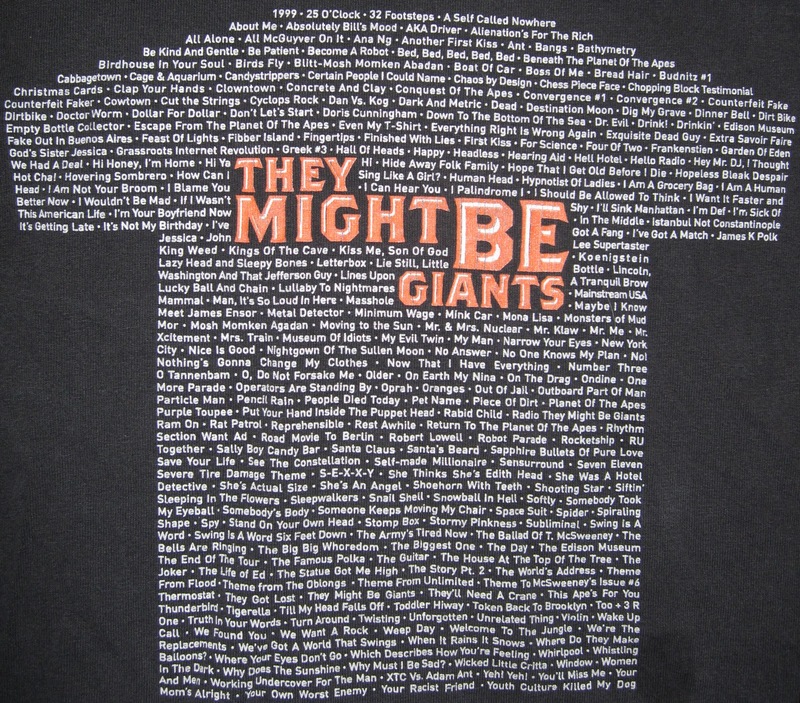 The list has been printed in the shape of a t-shirt, effectively having it a double as a tribute to 20 years of TMBG shirts! This is the original, "ringer" version with white collar and sleeves. A small graphic on the back pictures an old-fashioned looking telephone with only four buttons that read, what else? 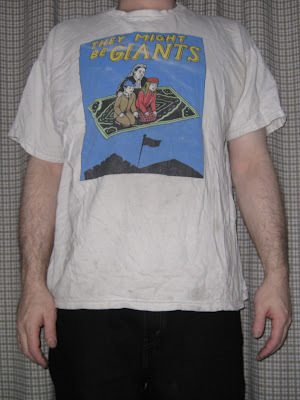 TMBG. It reads, "Dial-A-Song 718-387-6962" as well as the slogans, "Since 1983. Just a regular call to Brooklyn. Always busy. Often broken. Free when you call from work." 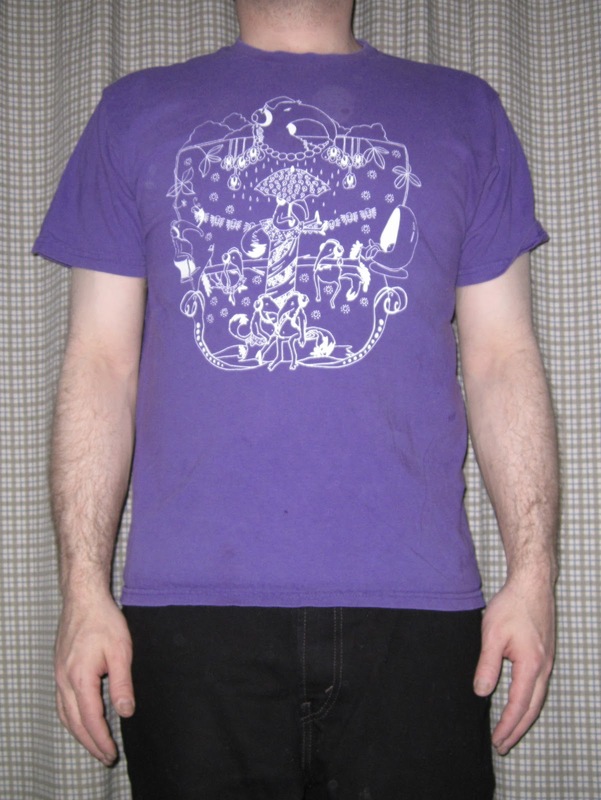 I also have a later shirt with a larger version of the t-shirt graphic, for slightly easier to read printing. 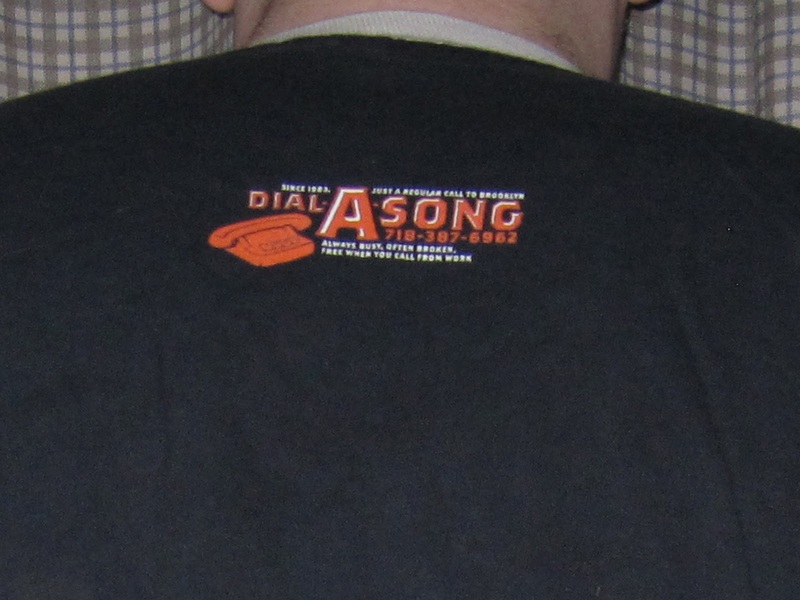 Of course, Dial-a-Song is now extinct, but the shirt can still be enjoyed! 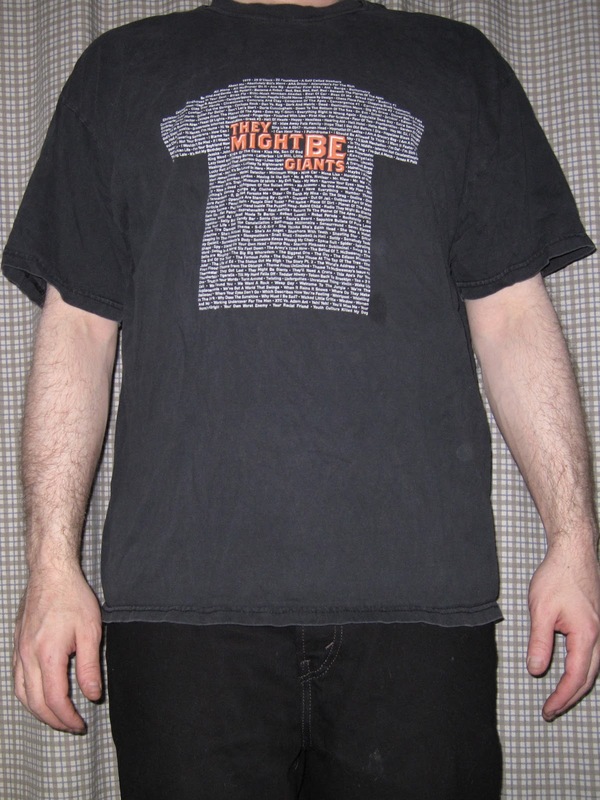 Currently on the TMBG Merch Store is "Large Graphic Songs on Black", pictured above as well as "Small Graphic Songs on Black", which seems to be third version that's a cross between these two; it has the smaller graphic printed on a non-ringer shirt. Performed on 6/17/88 in Austin, TX. Listen for "you've got the needle out" in the opening, which was cut on the album. 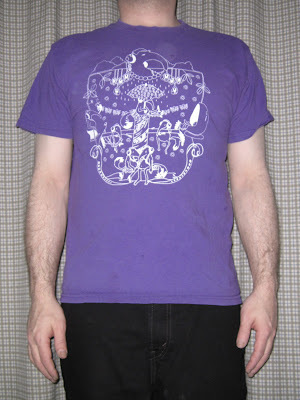 This week's shirt is a sassy purple. Coming to us courtesy of the They Might Be Giants Podcast is a very popular design among passionate podcasters and anteater aficionados alike. In a charming illustration by anthropomorphic enthusiast Jess Rotter, four social pairs of anteaters are depicted lounging, strolling or just hanging around while enjoying their TMBG podcast via large pairs of headphones. 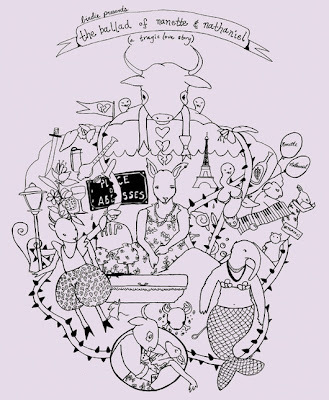 The female of the species are represented by skirts and high-heeled shoes. These guys are surrounded by vegetation, rainy clouds and.. tiny flying skulls? Here's a more detailed look, courtesy of jessrotter.com. 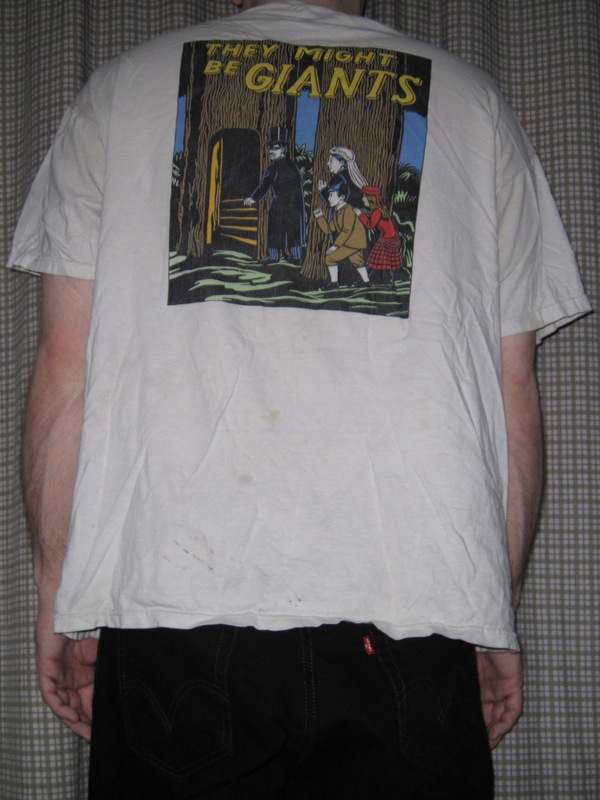 I e-mailed artist Jess, and she was kind enough to share some details of her experience with us: "John Flansburgh came to me with the idea for a tee shirt in 2006, after he saw an illustration I did for a British clothing line called Birdie (above). He wanted to create a world of music lovin' anteaters simply hanging out and listening to their favorite band: They Might Be Giants. (duh!) My favorite critter in the piece is the one in the mod stereo chair where you can only see his little belly and feet. 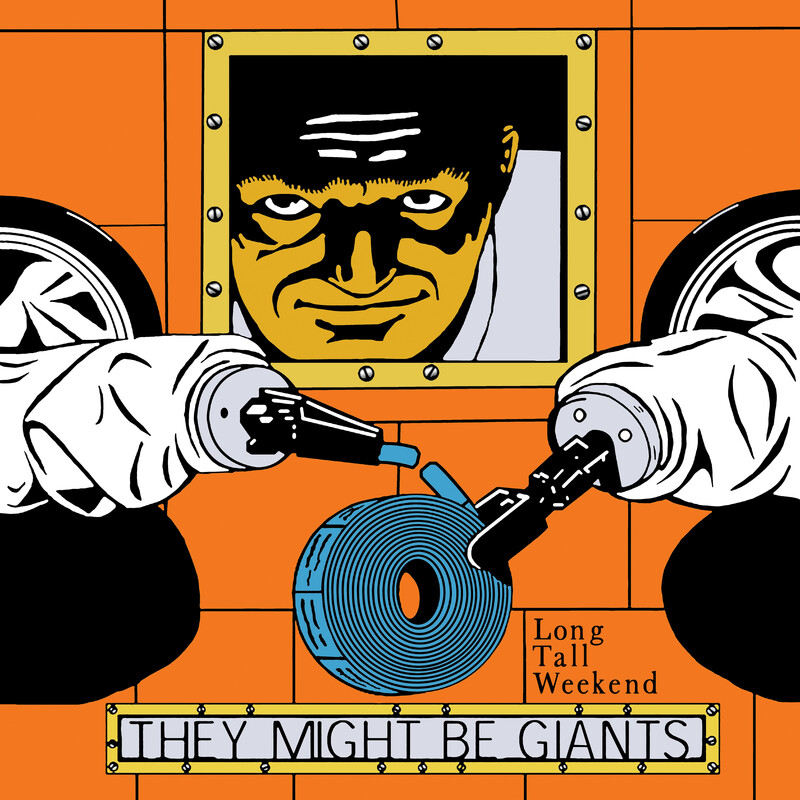 I had a lot of fun making this piece for the Giants and hope that it makes TMBG fans beam." 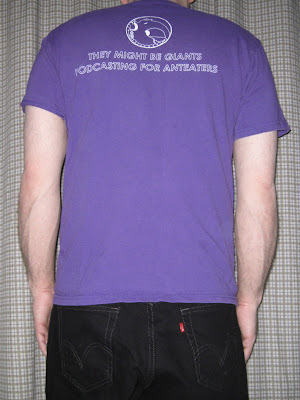 The back of the shirt reads, "THEY MIGHT BE GIANTS PODCASTING FOR ANTEATERS" with a reappearance of the largest headphone-wearing mammal. This illustration also serves as the cover art for the "Podcast Highlights" promotional CD. First introduced in late 2006, this "Benefit for Bandwidth Anteaters on Purple" t-shirt is still available for purchase on the TMBG Merch Site. Support the podcast, and someday soon we just might be blessed with a new episode! A short, improvised song that was performed on 9/28/98 at The Barrymore in Madison, WI.